In the co-op action/adventure game Lara Croft and the Guardian of Light, Lara and the Aztec warrior Totec find themselves in a race against time to stop Xolotl, the Keeper of Darkness, from destroying the world. 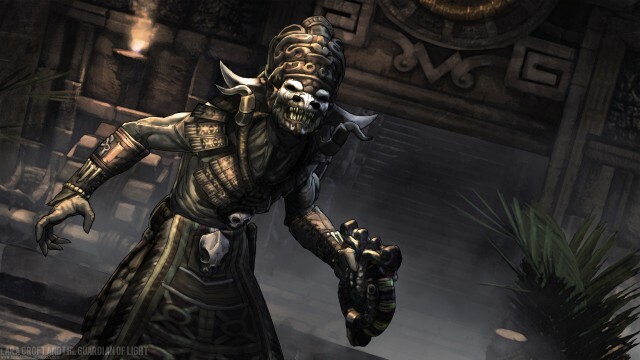 Players may come across a number of relics throughout the game that are named after Aztec gods and mythological creatures, such as the Mask of Tezcatlipoca and Eye of Cipactli. But if you can’t tell your Cihuacoatls from your Huitzilopochtlis, you may find the following resources useful. 1) Aztec Mythology and Religion (Wikipedia) – Wikipedia is probably one of the first places anyone would visit if they want to learn more about a certain topic and it’s not hard to see why. The Aztec Mythology and Religion category is packed with information on the various Aztec deities, legendary creatures, mythical locations, and religious practices. As with most Wikipedia articles, many of the articles in this category have bibliographies and/or links to external sources for further reading. 3) Aztec/Mexica Gods (Mexicolore) – Mexicolore’s site is jam-packed with information on the Aztec history and culture and while most of their resources are aimed at teachers and school children, their articles on Aztec gods are informative, fairly in-depth, and illustrated with photos and images adapted from those found on Aztec codices. A good place to start is their 2-part introductory essay, The Gods in Pre-Hispanic Central Mexico, written by Professor Guilhem Olivier of the Universidad Nacional Autónoma de México. 4) The Myths of Mexico and Peru by Lewis Spence (The Internet Archive) – Although this book was originally published in 1913, Lewis Spence’s work (though slightly outdated) is still considered a classic amongst mythologists. The first chapter deals with the cultural history and anthropology of Pre-Columbian Mexico while the second and third chapter explore Aztec religious beliefs and myths. The rest of the book is devoted to the study of Maya and Peruvian history and mythology, making it a great read for anyone interested in Central and South America’s pre-colonial past. 5) Aztec Calendar – Though not strictly a site about mythology, it’s impossible to understand the Aztec sacred 260-day tonalpohualli calendar without a basic understanding of Aztec cosmology, so you’ll be glad to know that this site does a good job of explaining how the Aztec calendar system works (they actually used two different calendars) and what role the gods played in Aztec timekeeping. If you find the concepts of sacred calendars, day-counts, and trecenas (the Aztec 13-day “months”) a little overwhelming, you can skip those sections and browse the site’s list of Aztec deities.